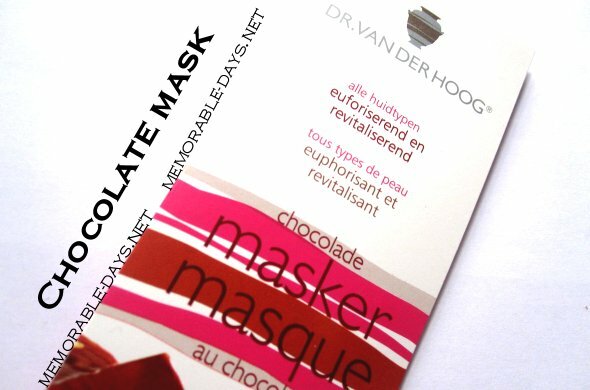 Review: Dr. van der Hoog Chocolade Masker | Memorable Days : Beauty Blog - Korean Beauty, European, American Product Reviews. Today I tried the chocolate cream mask of the brand Dr. van der Hoog, a Dutch brand. I wrote a review about their fruit acid mask a while ago and I was very positive about that one. The chocolate mask is for all skin types. It's an anti-stress and revitalizing mask. This mask will clean your face and it contains natural cacao extracts like cacao butter to soften the skin. This cream mask has a light brown color and it smells like melted milk chocolate. The scent is niceee xD almost want to lick it hahahaha. This mask costs €2.05, it has 10 ml in it which is a lot, I had put a bit on my neck as well. The packaging looks the same like the fruit acid one. Clean the face and put the mask on your face with your fingers or a brush. I used a cheap brush xD lol. Of course you have to leave the mouth and eye area open. Leave this mask on your face for 10 - 15 minutes. I left it on for 25 minutes hehehe - see picture below. Sorry for the lighting difference, but the important part here is that you can see that the mask has dried up and that my skin has absorbed the mask a little bit within those 25 minutes. When it's time, wash the mask off with water and pat your face with lotion after wards. My skin still felt dry after I used this mask (before I used the lotion), so it didn't really soften my skin. Besides, it didn't clean my pores as well. However, I really liked the scent of the mask *nom*nom*nom* I'm a chocolate lover ♥ and I did feel relaxed when I had this mask on. However, I won't buy this mask again since it didn't do anything with my skin =/. Have you tried any chocolate masks before? Go to my previous mask review: Dr. van der hoog fruit acid mask - http://www.memorable-days.net/2010/09/fruit-acid-crememask-review.html. it seems to have a nice smell :D!! I thought all masks are meant to be removed after 15 mins max! The japanese logic is if u put on the mask for too long the mask itself will start to try and ''pull'' back the moisture from your skin. How long did you put on the fruit acid mask before? omg no but i wanna~!! it sounds soo yummy :) I love things that smell good. they don't have to work as well as other things as long as they smell better haha :) thanks for the review!! :) too bad it didnt work! @Jennifer, yeah i know. Usually cream mask and clay masks it is 15 minutes max.. but i didn't look at the time and it was 25 min. already w0ops.. i had the fruid acid on for 20 min. or so~ instead of 15 min. heheh.. but that mask was great xD! @hihihi! hahaha i love masks that smells good and works great as well xD too bad that this mask didn't do much. @beautyknot, thank you sweetie ^^ ! @Tezza, hahahaha =D it smelled so yummy !! That second picture looks like a scoop of nutella...yummmm. If I bought the mask, I think I'd lick it just because I'd be Really curious. @Joey, yeah lots of people are saying that my newest posts doesn't show up =( makes me sad !!! @ELle, WAHHAHAHA, it doesn't look like poo !!! it looks like chocolate =p ! !